You screened Shirin at the Venice Film Festival. Shirin is a very unusual way of making a film – just the faces. In spite of that, glory to the audience, because they were very patient! Shirin is a very difficult film which needs a lot of patience, especially when you don’t have the right subtitles – although without the subtitles, you can just look at the faces and that is it. But having the subtitles on and off as a matter of fact, distracted the audience. And they weren’t even in sync – a scene with a boy screaming ‘Shirin!’ and forty five seconds after that it was written! So it was really a mess, an uncontrollable mess. I find it amazing that such a respected film festival could screw up a screening so badly… especially as you had just been awarded a lifetime achievement award! Like our own country and I understand it very well, they have a very old civilisation like ours and countries with very old civilisations always have the same problems – we are experiencing it here and it is familiar to me, nothing new, no surprise. When it would go really badly in my nerves, I would say to myself, it’s OK, they are like us. Part of our own country! Before, I was saying, for me it was a very good reaction from the audience, despite the problems and the complexity of the film which would make it difficult for them to bear two hours of sitting there and watching that, they actually sat there for two hours and watched it. I had many different reactions from the audience – some didn’t like it, some liked it – and that was the history of the projection at the festival. Now Shirin is going to take her own journey in the future and we shall see what we have. This idea of watching the audience watching the film – an unusual idea. What were your aims in doing a film from this perspective? I feel like I am not authorised to talk about that because it is too soon, too early. Shirin is too young, we should wait for her to grow up a little, and then talk. I like to see the audience’s reaction and then read the critics understanding of the film and then add something to that, if there is something to add – and then see how close we are to one another. There is so much analysis of your work from around the world, so many different interpretations. How do you feel about this avalanche of analysis and how accurate do you feel people’s perceptions of you are? Now are we are facing a second difficult question, I think I would prefer to answer the first one! From my very first movie, what was my concentration, my inspiration, was I didn’t want to narrate something, I didn’t want to tell a story. I wanted to show something, I wanted for them to make their own story from what they were seeing. And in Shirin, I think I have touched the limit in this kind of attitude towards art. Actually, I am putting the storytelling outside the main frame of what is really happening and what you can see is your own story, being seen on the face of the person you are looking at. Therefore, you have so many different stories, so many complicated stories, that you know the story but yet you don’t know it. You can guess the story just by looking at them, without knowing exactly what they are telling. It leaves a lot of space, for you the viewer to look at it. I am not telling you the exact story, but it is there for you to find out about. That is my idea of the art of cinematography. I would love actually, for Shirin, to be shown to people with the sound off, for me especially in this movie – which is the ideal in not telling the story – this story is really outside the frame. What you are hearing, is not to do with what you are seeing. I don’t know if you have seen 5, but for me, Shirin is the logical continuation of 5. Those faces are like looking at nature – it is like looking at the sea, or other natural scenes. When you look at those faces, you are seeing a continuation of nature and the expression is natural – so, for me, this is the logical step after 5. [Laughing] You’ve got it all, you’ve got it all! Something else, I need to mention is the relationship between cinematography and photography. Taking a picture — this storytelling coming out when taking a pic is just freezing a moment, taking it out. I missed that one – I said about my photography why I liked photography is because I didn’t have to tell stories. Competing with the actual official cinema, what we know as modern cinema is at this time, very difficult. Because I do not want to use the same means – the violence, anxiety – I understand for the audience which has been very very lazy til now, being seen something that was already digested for them, ready made, ready to use, ready to wear, the culture is there – therefore it is very difficult to propose to them something that simple for me, that complicates it for them. They are too lazy to find out what is going on. I just show nature and ask them to understand it as it is. It is very difficult. The majority of audiences are going the other way, I understand that, I respect that. I might get a few viewers, which will be enough for me! For me, the mistake is about the function and theory of cinema right now. People expect entertainment from cinema, they expect the same thing that they get at home while watching the TV and having their dinner. The TV dinner is a thing that – watching serials, they expect the same thing. Even if they want to say a good thing, they’ll say, ‘I didn’t feel the two hours passing by!’ They didn’t get anything in these two hours. I think they just want to kill their time. Cinema should have another function, it’s not a TV series you watch when you have your dinner. It should make you think. People are lazy right now. They want a ready made thing. You can’t compete with McDonalds! Everybody knows that I am not usually patient enough to actually sit down and watch one of my own films from the beginning to the end, I never do. But this time, I have seen Shirin for the 30th time. This is because there is no story. It is like watching something happening through a keyhole. The same difficulty – you have to go like – this – and bend down and watch through the keyhole. You see the difficulty. Each time I see someone blink in this film, it is like a new discovery for me. Each time I go through it, I see something new. It is an unfinished story, each time you project it, there is always something new, something happening in it. This film represents a point where you say from your first film to Shirin – represents the end of a cycle. Many of your past films have almost seemed to have grown out of each other – a germ of an idea will be in one film and then explored fully next time round. So, where do you go from here? Now I was just filming a sequence with a friend and he was saying, which part do you think you’ll end up using? And I said, I’d rather take the frame in which the two people are out of the frame and not in the frame. The frame is empty, we know they are outside the frame and that is the best part. I think that is what we are talking about when we talk about taking the next step, the story is outside the frame. Maybe it is not in the context of the interview, but this is what I am filming. There’s a marriage going on, a ceremony, somewhere in Iran. Everyone is covering their face, even the bride – and throughout the ceremony they don’t take it off, even for photographs. The photographer tells the bride, ‘It’s not my problem but 20 years from now, you’ll want to know how you looked today – so what I can do is I’ll leave the room, I’ll set the camera, you stay in here with your husband and with the click of the camera, you can have at least a souvenir of your wedding.’ So, he goes out, but the two of them don’t know anything about the camera, and we are watching the movie, we see an empty frame, they aren’t in the frame, they are out of it. And you have the feeling, that the two of them are somewhere near the frame but not in it. So you follow the story without seeing it, I am very tired of showing everything. Everything is showing us all the time – I am tired of showing everything, everywhere. Pictures, it is like voyeurism in the end, I don’t want to show everything, I rather the viewer thought about it. You’d rather give the space and freedom for the viewer to come up with their own explanation? I want them to be active, when a new neighbour comes around – everyone from this house knows what is going on! Why should I be the one who explains everything! People are usually creative, I don’t know why when they are sitting in the movie theatre we have to give them everything. Every detail. They can create for themselves. “Good cinema is truth…” you said once. You are very right, quoting me on that. The film I am working on right now, I don’t know what it is going to be – it is like a baby. I am thinking of making a baby, but I don’t know if it is going to be a boy or a girl, what size or anything, but the plan is there. But what I know for sure, is that it is going to be as real as possible, no paraphernalia, no extras, nothing. It is going to be as real to what I am thinking as possible. Showing without showing. You can see what you can see. It is there and not there. People will almost feel anxious that they don’t “get it” – that they don’t understand what you are trying to say, it worries people that they are not getting the correct interpretation. The beauty of it is that there is no truth to grasp – what you see what you think – that is the truth and reality. It is what you see and what you think. That is the truth. The way you use amateur actors and non pro’s. Is there a link from your early career working with children to the way you direct actors now – using non actors? How difficult is it to work with amateurs? You pointed out a very important function for me, because it came exactly from that time when I was working with kids. For children are not conscious of their face, how they look, their elocution, how they pronounce – they are not yet conscious of all that. They don’t play games in front of the camera. So you need a different policy with them, which is why I use non-professional adults. Each time I have had to use different policies. Each time it changes – the main thinking behind it is that same. I don’t want them to play. They don’t get scripts, they get scenarios, they improvise? I haven’t specific situations to talk about but I know that without that spontaneous energy that comes up in these situations, I wouldn’t have the energy to go on talking about my films. Just a blink of an eye can make my day – it’s like fishing, I like to compare it with fishing. The fisherman provides the net, the place, the rod – everything is planned – but he doesn’t know exactly what kind of fish he is going to catch – he may even know the kind because he knows the site to fish – but that net will be full of surprise. That is what happens to me – I prepare everything, but it is going to be full of surprise because I let the fish play in that net and as I told you, a blink of an eye can make the day and give me the energy to go on to the next day of filming. Without that, I couldn’t work, without that surprise, everything is planned and organised – that doesn’t make me feel right! You know Deborah Young, the critic? She saw Shirin in Venice and she said those viewers who had the patience to stay in the theatre actually had the award of seeing it all, it was worth it. It tells you the personalities, they don’t know what is going on. They don’t believe that they are just going to see faces. It is very connected to the photography exhibition this is a very unique occasion of viewing 117 faces of women in a very exceptional situation – it is such an internal emotional feeling you can see on their faces, it is a very unique occasion. You don’t have that much portrayed in that time usually, it is very rare. I haven’t seen Blue, but I feel I could have felt a lot while watching it. The question for me is why people disagree with it? It is like going into a gallery and seeing so many portraits, one after the other. But instead of walking around, apologising, because you have stepped on someone’s foot – you just see in the gallery walking around – why shouldn’t you like this? Why are we always trying to define cinema separately from photography and music – they are connected, they mingle and are interwoven? Why do we like to have something very specific and defined? If that was the case, then the person who likes cinema shouldn’t go to the gallery or vice versa. We have to have them all together. When you go to a mosque, you should not try and see the effects of a movie, especially when you are a fanatic. If not, then why should we not intermingle all that. But so many people say, this is not cinema, for instance, this is an installation! So what – then watch it like an installation. Why be like a fanatic and say, I can’t watch this because it is not cinema. OK, enjoy it. They feel cheated. ‘They promised us cinema, mama! They gave us an installation! I feel cheated!” I think they are lazy. My photographic career started, as a matter of fact, when I went to buy a camera for a friend. It was a thousand something dollars, and I thought, I want to buy one for myself too. At that time, I used to go out of town very often. The first photograph I ever took, was the one sold at Christie’s for $130,000, that was the first one I ever took. If I knew, if someone had told me then that you have just spent $1000 on a camera and then in the future you will sell just one photograph you took today for hundred times more, I would have a horn on my head! I would be astonished. I took so many, one after the other, it was such a pleasure. And then for ten years, I took more and more and I happened to show my collection to a friend who had a gallery here, in Golestan. And she said, why not have an exhibition? So she arranged that. The exact year of the revolution, 1975, no 1979. That is when I started taking photographs. We had a lot of spare time, because of the revolution, we couldn’t make films and we were very depressed. So we took ourselves out of the town and deal with our depression. I had this camera, a Yashica and started shooting. It was a cheap camera. After that, I bought a Leica, but in the snow white exhibition, I took them all with the Yashica and the Leica and I couldn’t tell the difference. But that was a very famous Yashica. The one who bought it, they all knew that it was an exception in the Yashica production. SW is an exhibition that built up over thirty years. A very distinctive approach to photography – lots of nature, the elements that coalecse into a whole. What is the trigger that makes you click a photo, how do things combine to create that perfect balance of elements in a photo? Definitely. In the same exhibition, there is an isolated tree that they say is 800 years old. I passed by it loads of times, took hundreds of photographs of it. And one day, there was a magic in the air, that I could say, this photograph is going to be the one. I knew it. And the scenery was so strong, it said to the light, to the Yashica, you go your way, you have nothing to do with this magic. I am the magic, the scenery is the magic, the light is the magic, the moment – and either of you can do the same job. You’ll see this photo in the exhibition and you’ll know by the moment that that was the magic moment. Two topics have been always inviting for my photography – trees and roads. Therefore after 25, 30 years of photography I had these two different topics, trees and roads. So I separated them in two different exhibitions and the photography you are going to see in this show have been taken over 25 years. Another thing, there is a lot of space, a very strong sense of loneliness and isolation. You once said, “Not being able to see nature with someone else is a form of torture – that is why I started taking photographs.” You wanted to internalise those moments of passion and pain. Is that equal to the SW series, the roads – is that something you’ve always felt? If you can feel it and see it in SW as well as in Roads, then yes, there it is – and if you can’t see it, I have to say, yes, there it is still! That’s right. You should know that the external revolution, the Islamic revolution which was going on at that time, was hardened by an internal revolution going on in my personal life. I can separate – myself from the roads of course, of course, the way I was looking at the roads would be very different to say, the way someone looking at the way the roads needed improving would look at them. They were two different ways of looking at the roads, two different ways of thinking. That was my way of thinking, my emotions at that moment made it this way. With my own emotions, I could see them this way. When you look at them, your own emotion is coming into in and influencing it. For instance, if you know nothing about the experience of loneliness then you wouldn’t understand this. But with the experience of loneliness, it will help you to understand my loneliness through those roads. No, it wasn’t the roads themselves. I never decided to take those photos, or I didn’t choose a topic. The topic chose me. I am sure that many photographers passed through those roads, on the way to shoot fishermen on the seaside or something. It is the same road, but it is the way you look at it that makes the difference. Right time, right place! The things must reach an agreement with each other, right time, right place. I’ll tell you a story about the tree. I had passed by that tree lots of time when I was making A Taste of Cherry. The quality was not good – I sent for a print, but the print quality was not good. I knew exactly the location of the tree – and I wandered with my new camera to the same tree – same light, same time, same angle, – but you are not going to believe me, it was not the same at all. So I knew when I took that photo the feeling of loneliness was there. It was there from Taste Of Cherry I had the excitement, I knew I was going to use it for the promo poster, something to look forward to – I was like a business man looking at that tree like a project. But it was not the same. It was not happening any more. I showed it to so many people and they would say, it’s the same – but I don’t know why this one is better, the old one. So kept that old one, it’s the one. You can feel the loneliness, that’s when I understood, you usually believe in the sensitivity of the negative, not your own. It counts, it changes everything. The same photo, the same location, but the feeling is not there. I just want to talk about A Taste Of Cherry… seeing as you mentioned it. I have like, eight million questions on that. One of the most famous films you have done, so many issues addressed by it. 11 years on, how do you feel about the film? As I said before, this is one of the films I have never seen from start to finish! Even at the screening at Cannes, this was one of the films I was fearful that people were leaving – I was closing my eyes and opening them every three minutes to see if people were still there! Another three minutes – the joy of seeing people were still there. But I don’t know what I can tell you about it, I remember working on it of course, but I haven’t seen it all the way through. So what I can talk about my plan, what was my intention. Of course, I had to stick to technical choices and options while making the film, while the two people were talking I had to have close-ups of course, and then the long shots – I wanted to show something far away, what I want to emphasise right now after all we have discussed, all the limitations, the techniques, all the planning imposed on you by external reasons, that is not what makes a good movie. What made it a good movie – if it is a good movie – is that sensibility that is going on and going on during the making of the film. And all this passion you are talking about, the same as the photography, the same passion was there. Maybe now, afraid of looking at it once more and thinking, Oh my God, why do they like it so much, it’s not that good. OK, let it be there, let them say it is a good film and let’s leave it there! In poetry, you’ve found a lot of solace and comfort. Could you tell me which poets you admire, which poems have inspired you and given you comfort? I am going to repeat myself as I don’t have a better answer, but I have to confess I am a restless person. A lonely, restless person. When you cannot go filming, when it is Friday night and everyone is out having fun somewhere, nobody is ready to work with you, you can’t take photographs – or there are people with whom you can talk, but they can’t satisfy you at that moment. Sure, in Tehran, I am invited every night to places, but I can’t be satisfied with that – I want to do something else. Going out, seeing people, filming, taking photographs – that lonely moment is when I read or write poems. The collection of poems I had published has the same storyline as the photographs, I have them scattered all over the place, a few lines here, a few lines there, a few poems in this place or that place – and circumstances decided to collect and print them, encouraged by friends. A good thing about poetry is that you don’t need anything – no camera, no light, no instrument – you can still write. In a nightly court, when I was being judged, the poems saved me. In the total darkness, poetry is still there, and it is there for you. No sense of nationalism, or patriotism. I am a citizen of the world. I never decided to be born here, so there is no honour to be living here. It could have been much better – I am not ashamed of being Iranian, even if it was much worse. It wasn’t my decision to be Iranian. To stay after the Revolution was my choice – and I did, I was happier here, I had a better life. 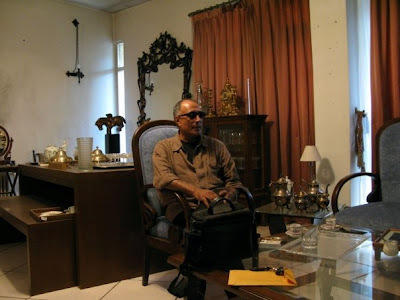 So people say ‘Iranian film maker Abbas Kiarostami’ is wrong – you prefer to be thought of as just a film maker? When I am outside the country, it feels good to be recognised as an Iranian director. I belong somewhere, that is the most important thing. This is the geographical credit, let’s say. It’s like giving an address, it’s just that I come from that part of the world. You are currently browsing the archives for the Venice Film Festival category.